these first three experiments occurred during a visit to the eastern united states in the fall of that year. 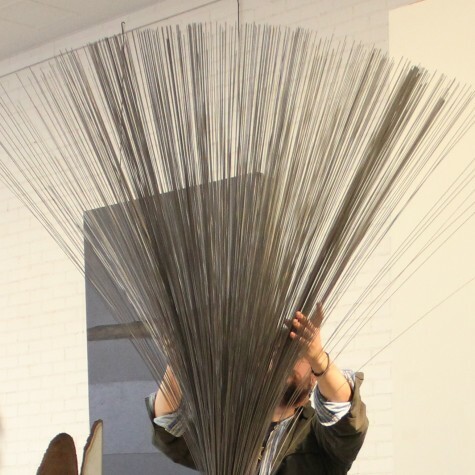 each had it’s particularities: the first was in the galleria of the baker center for the arts at muhlenberg college, in allentown, where i was given permissions to ‘play’ the harry bertoia kinetic sculptures which are on display there. the second was in my hometown, boston, where a very sparse performance space proved to be quite a challenge for finding sound sources. and the third, at bruce tovsky’s space in the brooklyn navy yards, expanded outwards, as the exceptional environment and visual collaboration with bruce led us to make our initial recordings, not just in the performance space, but all around the navy yard. for the performance bruce’s film was screemed, accompanied by found sounds from the yard mixed with the live playing of found materials in the space.